QM-Jerome Foundation Fellowship deadline has been extended to May 2! Sneak peek of our new website. Receive our monthly newsletter and stay updated on events, exhibitions, and more! We are thrilled to announce the upcoming OneBeat 2018 residency at the Queens Museum. 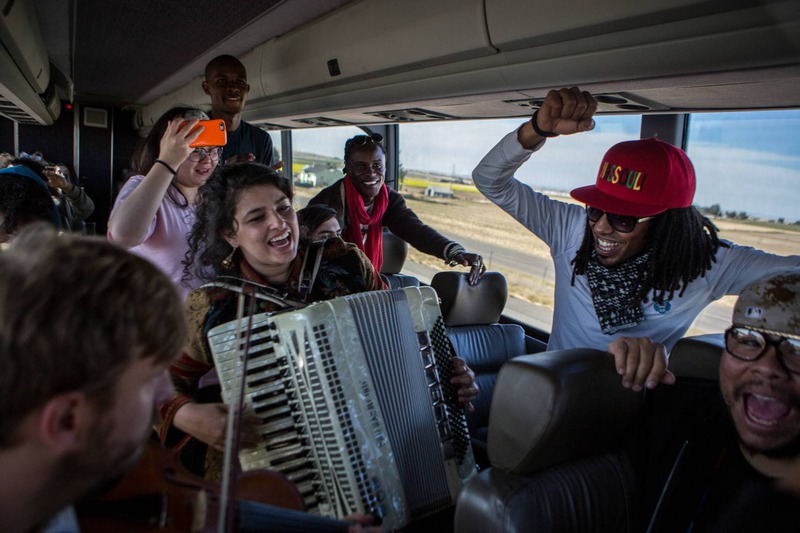 Now in its seventh year, OneBeat brings musicians (ages 19-35) from around the world to the U.S. for one month each fall to collaboratively write, produce, and perform original music, and develop strategies for arts-based social engagement. OneBeat begins with an opening residency, when Fellows collaborate to create original material, record new musical ideas, and incubate their projects. OneBeat fellows then go on tour, performing for a wide array of American audiences, collaborating with local musicians, and leading workshops with youth. During the month, each OneBeat musician also sets out their plans for the future, developing projects in their home countries linked to a mutually-reinforcing network of music-driven social enterprises. This year the residency will culminate in a series of community-embedded productions and final performances throughout New York City with: Bronx Museum of the Arts, Street Studio at Eddie’s Place African Market, Murrmr, World Music Institute, and Queens Museum. We are thrilled to welcome the 2018 cohort of musicians, hailing from around the world, to spend one week in residence at Queens Museum. They will be working across disciplines with Queens-based artists and arts organizations, exploring musical expressions of contemplative consciousness. This site-determined work traces the ensemble’s interweaving narratives of the imagined future, leading the audience on an immersive sensory experience through the corridors of the Queens Museum. Musical collaboration with Youth Orchestra, CYCNY (Youth Orchestra, Chinese Youth Corps of New York) with Alexis Weng, 14, cello, Diana Yang, 14, clarinet, Toby Ou, 13, violin, Austin Zhao, 17, saxophone, Tina Zhao, 14, violin, Mitchell Jung 14, cello. Please join us on Friday, Oct.12th at 7pm for the final immersive performance at Queens Museum produced in collaboration with Queens-based youth musicians and dancers.